A freshman at the time, Daniela Tacuri joined the West Orange boys high school wrestling team to stay in shape for soccer. Tacuri never envisioned how far she would progress just three years later. The 16-year-old took second place in the female 111-pound weight class at the New Jersey State Interscholastic Athletic Association (NJSIAA) Wrestling Tournament at Boardwalk Hall in Atlantic City in March. From a complete novice who took her lumps, to a fierce competitor, the junior came close to beating Manasquan’s Bella Serrano, a senior who was ranked No. 1 going into the tournament. In fact, the second-seeded Tacuri was ahead, 4-2, but Serrano scored a takedown with 20 seconds remaining in regulation to force overtime. In the extra session, the more experienced Serrano took Tacuri to the mat again, for the win and Garden State title. Though Tacuri — who posted an impressive 13-4 record against females during the season — went down in defeat, she said she walked away with several positives and is ready to work hard to reach her aspiration of winning states next year. As for Tacuri’s parents, they weren’t completely sold on their daughter competing in a rough-and-tumble sport such as wrestling. However, Tacuri said they had a change of heart after they witnessed her mat prowess at Regionals, which she won. But Tacuri wasn’t always a gifted grappler. She said she poured every ounce of her being into the sport and persevered through hard times to become the wrestler she is today. She made history along the way by becoming the first female on the team to beat a male on the varsity level. Tacuri would love to pursue wrestling on the collegiate level, but she said academics come first for her. The plan is to study nursing in college and find a school that fields a female wrestling team as well. Tacuri will play lacrosse for the Mountaineers this season and will train with Total Force Wrestling Club in Pine Brook in order to improve her conditioning and mat skills. She said she knows that being a top, successful wrestler doesn’t occur by happenstance. It takes tons of painstaking practice and conditioning. With that mindset and relentless work ethic, Tacuri plans on being second to none next season. Stepping is a form of percussive dance in which the body acts as the instrument through stomping, speaking, clapping and tapping. Step teams perform group dance in formation, similar to drill teams. Step teams use elements of breakdancing, gymnastics, tap and African dance to choreograph highly energetic and athletically demanding pieces. West Orange High School has two competitive step teams, Ab-Salute, the boys step team, and Nu Theta Omega, the girls step team. The boys step team won first place at Nationals back in 2012 and has placed in the top three in the nation for the past eight years. Currently, Ab-Salute is ranked number one in NJ and Nu Theta Omega is ranked number two by Youth Step USA. The West Orange teams compete against one another in the Youth Step circuit, but at the National Competition coming up on Memorial Day weekend at Newark´s Symphony Hall, the teams will compete in separate divisions. Youth Step organizes this event where the best teams from across the US will compete for over $23,000 in championship prizes. 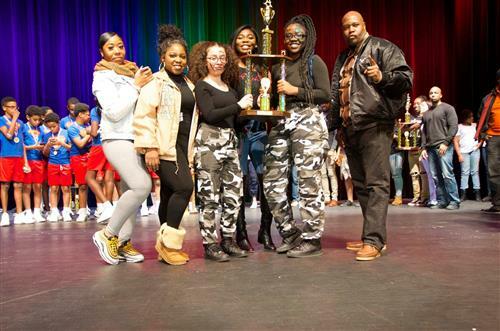 The spring is the busy time for the West Orange step teams, with many Saturday competitions organized between various high schools in the tri-state area. West Orange High School first started having a Step Team in 2000 when the current boy´s coach, William Farley joined the school’s faculty. At that time there was a girl´s drill team but no boy´s team. The school where Farley had taught previously had a successful boy´s step team, and Farley offered to start one in West Orange. That was 19 years ago and the program has grown to be the consistent standard of excellence that it is today. At the time that Farley was starting West Orange´s Step program, The New Jersey State Step Association, NJSSA, was also starting up, organizing regular competitions between step teams throughout NJ. This helped provide valuable experience for the West Orange teams and raise awareness of stepping throughout NJ. Over the past two years however, NJSSA has not been organizing meets in the state. As a result of this change, the first competition that West Orange´s teams participated in this academic year was the Regionals on Feb 16th. Ab-Salute and Nu Theta Omega performed exceptionally well at the regional competition, taking 1st and 2nd place respectively. “The Boys and Girls put on two great shows. That was our first competition of the year, so we are pleasantly surprised, and of course excited for Nationals,” said Farley in a recent press release. Ab-Salute, is still coached by Farley and Nu Theta Omega, is coached by former West Orange Student and current faculty member, Keisha Yarrell. Farley is adamant about offering the team members leadership opportunity. Each year there are two captains and two co-captains chosen from the team´s upperclassmen who help organize the team and lead in the routines. There are about 23 boys on Ab-Salute currently and Nu Theta Omega has about 25-30 members. The teams travel to events together, sometimes compete against each other and in the past have even tied for first place at the NJSSA Championships. Both teams are excited to be heading to Nationals and look forward to continuing West Orange´s legacy of excellence. Physical Education teacher and now Head Coach, Kailee Beal loves sports and competition. She has been working for the West Orange School District since 2015, when the idea of a Woman’s Varsity Lacrosse team was just starting to grow. This was despite other area schools having promising programs already in place. However, on March 27, the team lost its first ever game to Caldwell by a score of 12-1. Though a loss by such a large margin may have set back other newly formed squads, Coach Beale said, “the next day they (team) all bounced back and were smiling again.” As the West Orange Mountaineers embark on their new season, the coach is confident that they will learn the same valuable life lessons she herself learned from playing competitive sports as a student-athlete. This progress starts from the top as the teacher, coach and former collegiate lacrosse star at Montclair State University is leading the school’s effort to bring a competitive program to a growing sport. She does credit much of the team’s formation to the students and their parents who wanted this day to come. The coach remarks that many of the students have played other sports which helps when building a foundation for learning the new game. She then contacted the West Orange Recreation Department as well as some “motivated lacrosse parents,” to begin implementing some instructional clinics four years ago. The momentum grew and more girls were coming out to the practices. As a result, this past June, the program was finally approved to be a high school sport by the board of education and a sense of excitement was in the air. It’s the start of spring which means…you guessed it, football registration is underway. From our flag program to our six levels of contact football, there’s a spot for all children in grades first through eighth. Now you may ask yourself why should my child play football? Children play football because it is fun, challenging, and exciting. Most kids love being part of a team. Football teaches cooperation and team work, helps develop positive social skills and teaches respect for others. It helps build self-confidence, a positive self-image and self-worth. It enables a child to improve upon and develop a broad range of motor skills like throwing, catching, running, kicking, balance, agility and coordination. Because a large variety of skills and physical abilities are required on a football team, there is a position for every child to play. We strive to teach the fundamentals of football and life – from sportsmanship, respect, and teamwork, to Heads-Up Tackling, and the importance of having fun and building friendships! As a program we continue to invest in our facilities, working hand in hand with Mt. Olive Township to improve our game fields and practice fields, such as supporting the cost of field lights at $15,000 per year. This month our program has adopted some troops overseas and have started a go fund me to help with the shipping and supplies we’re sending them. The service men and women to which we are assigned to, are operating in the Global War on Terror in the Persian Gulf. They include special operators and their support teams and vessels. Through this endeavor we hope to teach the kids in our program important lessons, such as service and helping help those who keep us safe. You can donate at gofundme.com/marauders-adopt-a-troop. Looking ahead to next month, we will be holding our Fourth Annual Mt. Olive Friday Night Lights. This year’s addition will take place on Fri. May 31st at the football field at Turkey Brook Park. It’s a night filled with fun, friends and football! Any child who’s either thinking about playing football or already in the program are welcome to attend. Hope to see you there, Go Marauders!!! In the warmer weather going to the park is a classic outing, and now kids and parents alike in Mount Olive have reason to celebrate. 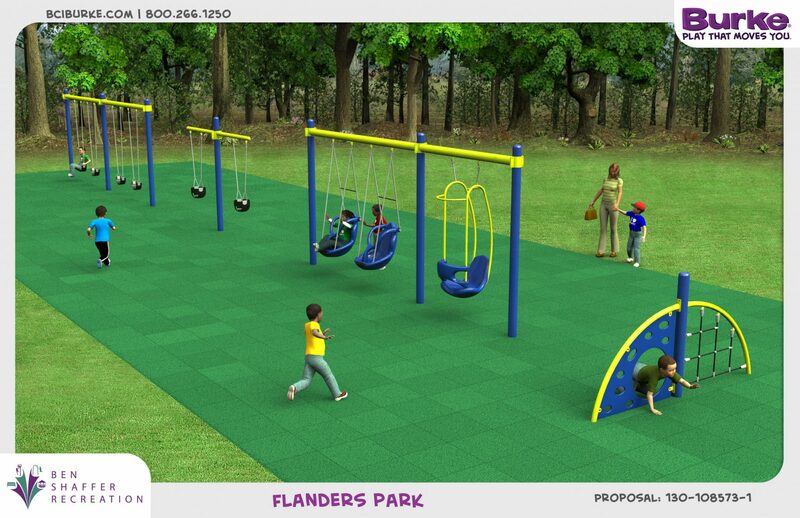 Over at Flanders Park there will be a brand-new playground and other improvements are coming to the township. After 20 years, the park is going to receive a sprucing up. In addition to the refurbishments, they will not only be visually pleasing, they will be enhancements for everyone. Including those with special needs. Officials have budgeted approximately $300,000 for improvements. Construction is slated to start in April and finished by the end of June before school lets out for the summer. The park is located on Flanders Barley Road and township officials are thrilled to see it renovated. Meininger describes that there will be four youth swings, two toddler swings, two ADA compliant swings (for children with special needs) and one parent/child swing. There will also be a playscape equipped with three slides, ADA ramps, musical and touch features and protected sun shades. Both areas will have a rubber under matting for enhanced safety. “The swings and the playground are the original and over twenty years old,” she asserts. “Throughout the years, a lot of resources have been focused on Turkey Brook Park. Now that most of those improvements are done, we are refocusing our attention on other areas of Mount Olive,” she says. In easy walking distance from Flanders Crossing and the Cloverhill Development, with easy access to the new Regency Development, the park is very active for spring sports and in summertime for families. The response from the public has been extremely positive. In fact, it can be said that these revamped enhancements were influenced by the community itself. “The public has been asking for the park to be updated, requesting more components and shade,” Meininger tells. There’s even a walking track used by adults and kids alike, and the basketball courts have been resurfaced. After April 15th, lights for the basketball courts will remain on until 9:00 p.m. Looking to down the road, future improvements will include the construction of a Gaga Pit. Gaga is high energy, fast paced game played in a pit shaped like an octagon. It is described as a kinder gentler form of dodgeball, played with a soft foam ball where the more players there are, the better. Other ideas include a Bocce and Volleyball Court. Additionally, they are working on obtaining a sponsor to help fund an adult exercise equipment area.